We headed to Philadelphia for the July 4th holiday. But we stopped the first night by the lake in Geneva. Not Switzerland but upper New York state. We had time for a lazy drive south so we looked at the options for something interesting to see en route. 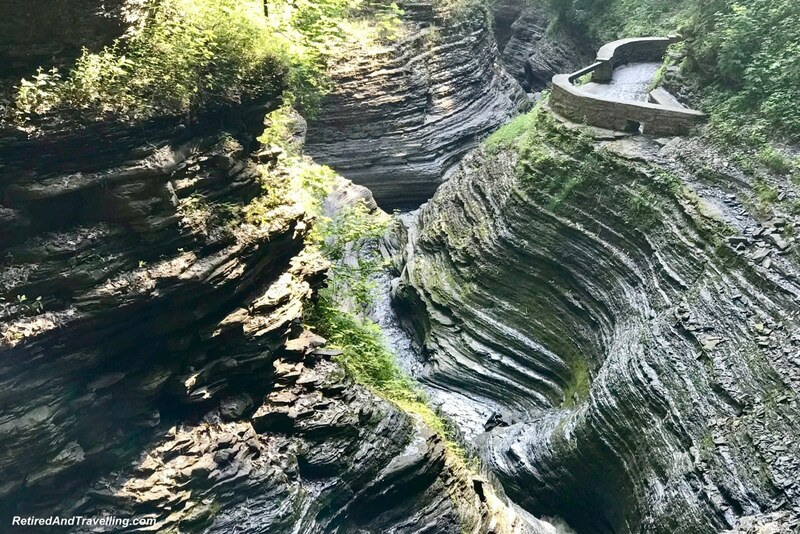 Our morning stop was in Watkins Glen State Park. 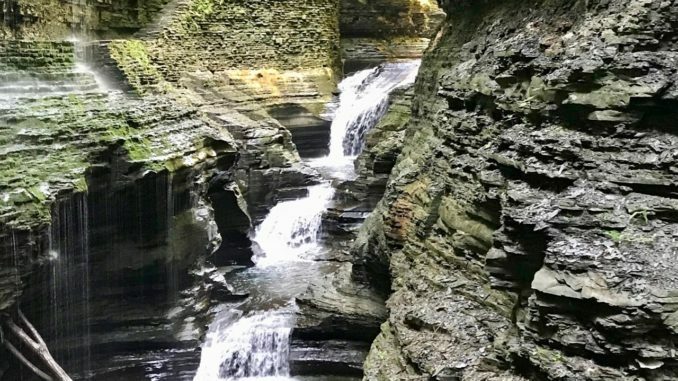 The Watkins Glen Gorge waterfalls in the Finger Lakes fit the bill just fine! We were up early and on the road before 8am. The heat wave was still in force and temperatures were soaring to 35℃ (or 95℉). At one point the temperature in the car was 47℃ (117℉). And this was the first big holiday weekend for families. So we wanted to be ahead of the crowds. 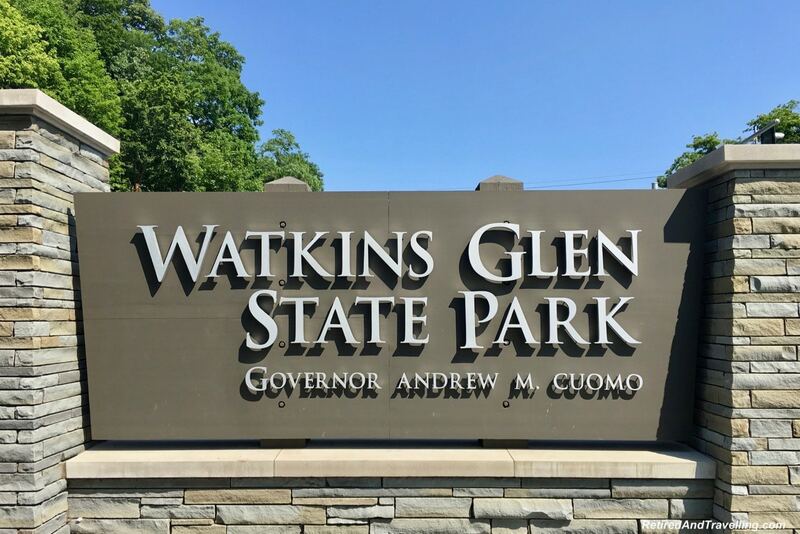 We entered the Watkins Glen State Park off of state highway 14. There was a big parking lot with paid parking. We made sure to take water with us. But left our sandals on. We thought we were going for a stroll along the bottom of a gorge. We soon learned our mistake. On the way in there was a map of the gorge with the key points along the route. 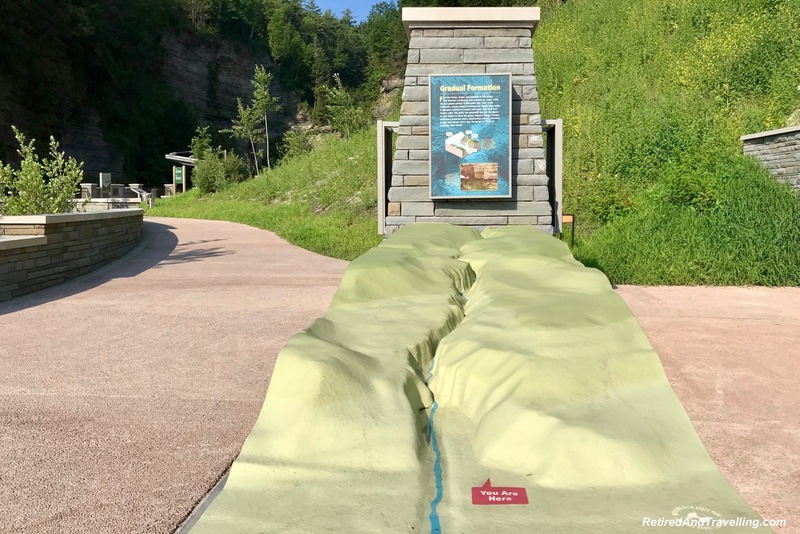 The information signs showed how the gorge was created by retreating ice. 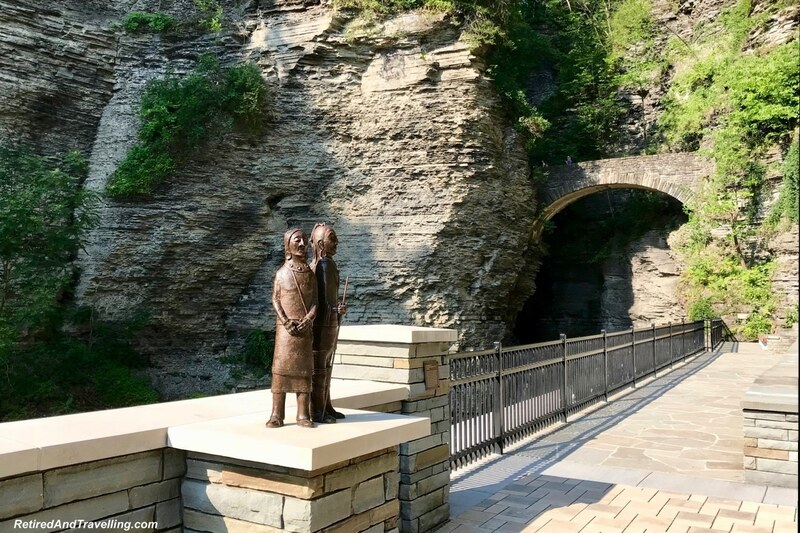 Statues of Seneca Indians talked about the history of this part of New York state. 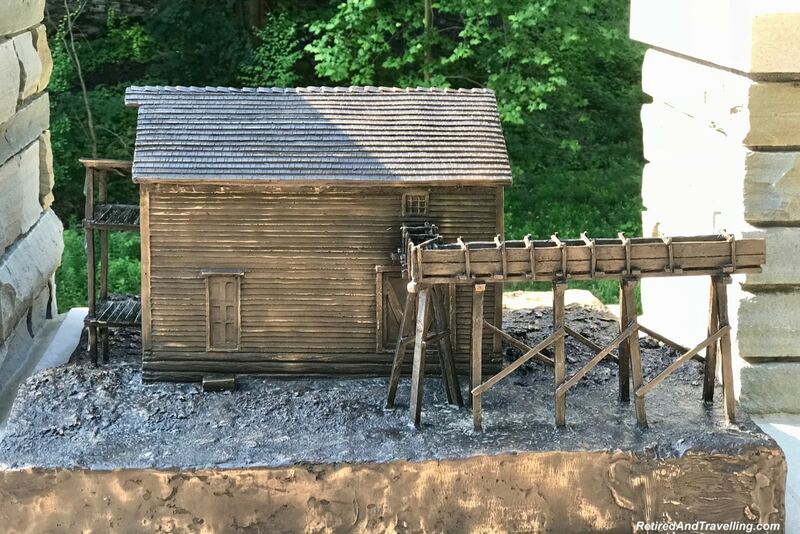 And a mill statue showed how the fast running water was once used. The water was a gentle flow at this bottom part of the gorge. It had been a dry few months and the water levels were quite down. 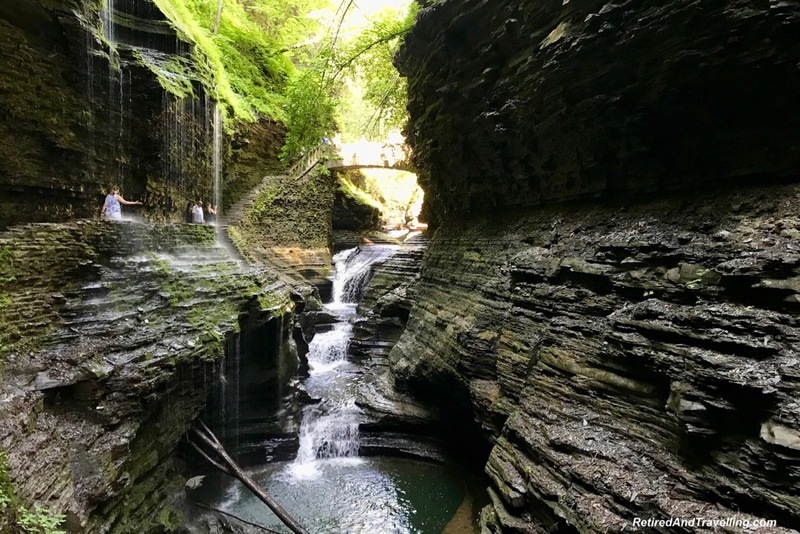 As we walked along the series of Watkins Glen Gorge waterfalls, we imagined how awesome this scene would be with the rushing water of a spring thaw. 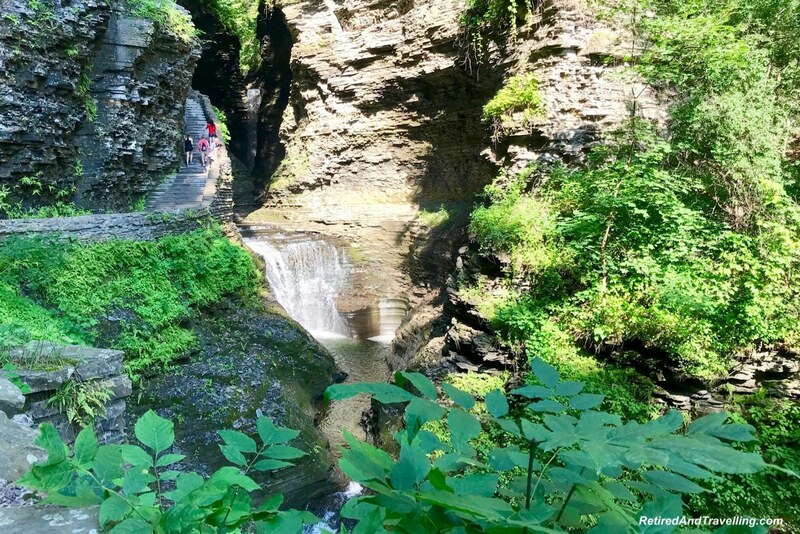 It was not long before we knew that our gentle walk to see the Watkins Glen Gorge waterfalls would indeed be a hike. We entered the gorge through the entrance tunnel. A steep set of wet stairs led up. We stopped on the Sentry Bridge for a look back along the entrance. 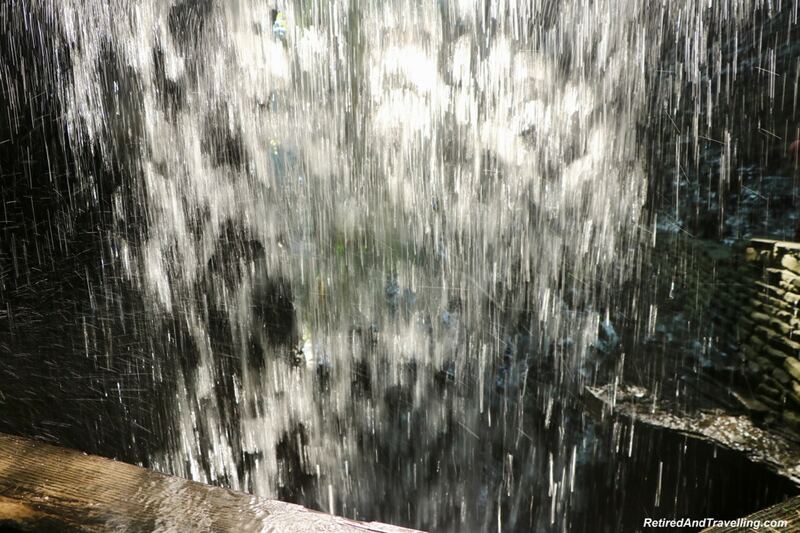 And then on the other side we got our first view of the cascading waters. 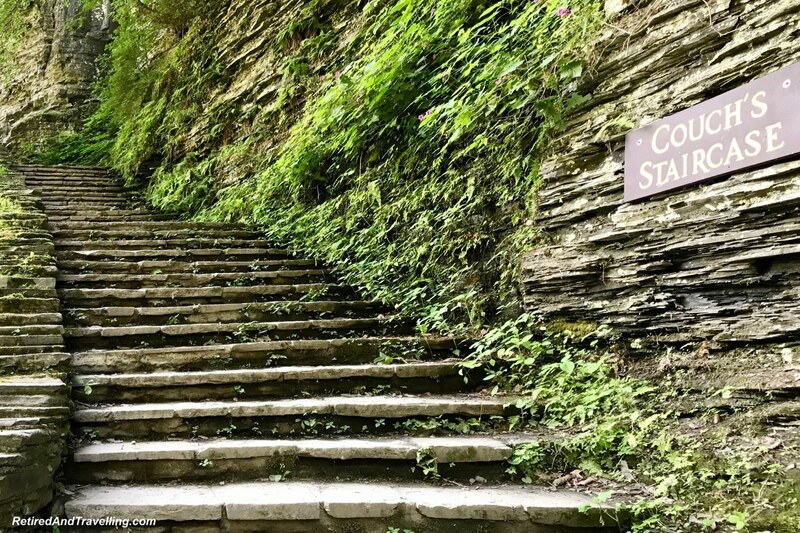 From there there was a stairway leading up at Couch’s Staircase for a higher path along the gorge to the Lily Pond. 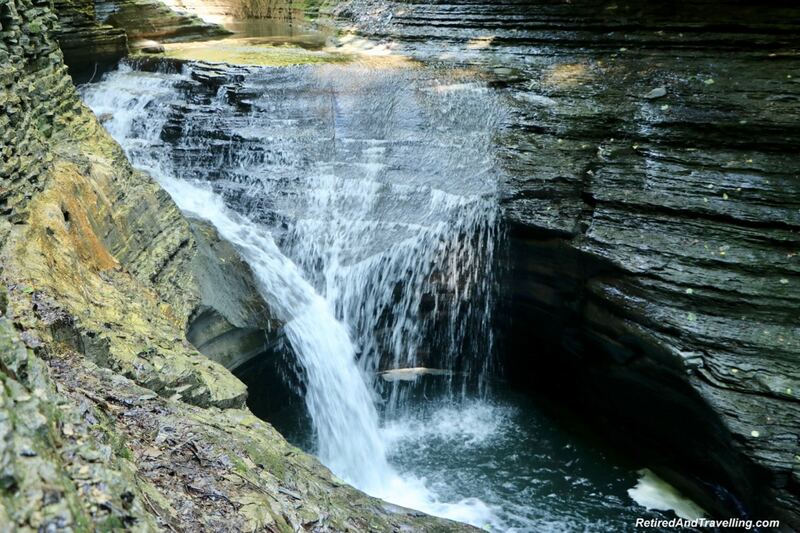 Or the lower path took you to the start of what was referred to as a “staircase of waterfalls”. I still was thinking the walk took us along the bottom of the gorge and then we rounded the corner. Several sets of stairs with little or no railings climbed from this level up and up. 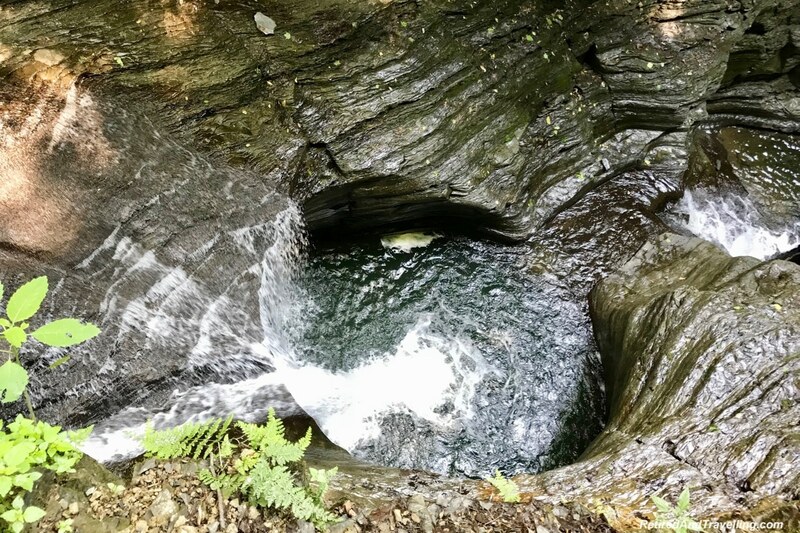 The water cascaded down beside the path. 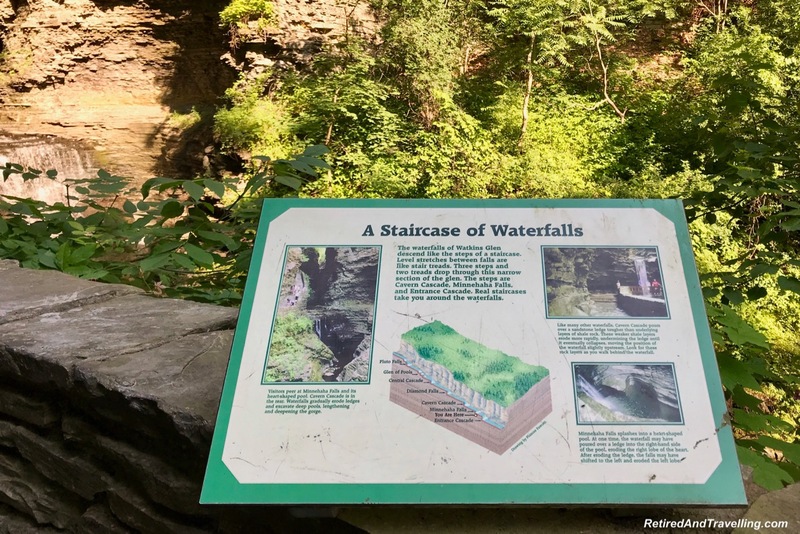 After we climbed this set of stairs, we stopped to look back along the gorge and the viewing platform over that first big set of falls. 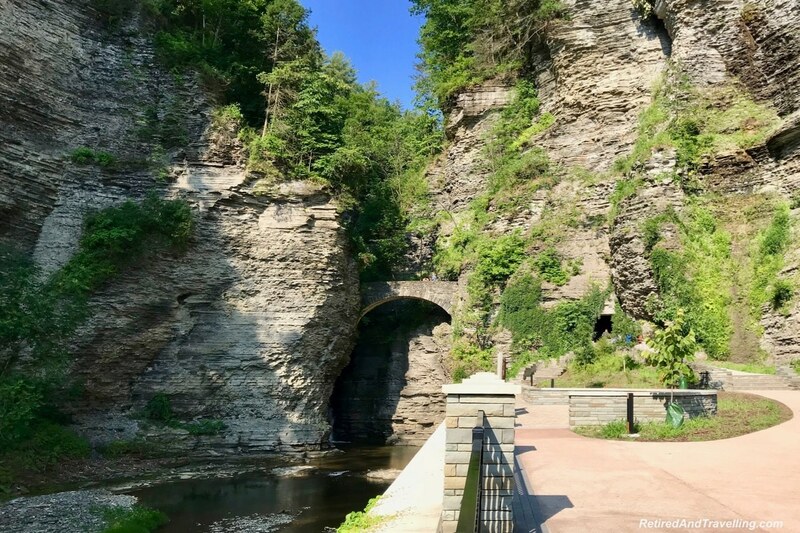 This was our first great view of the Watkins Glen Gorge waterfalls. 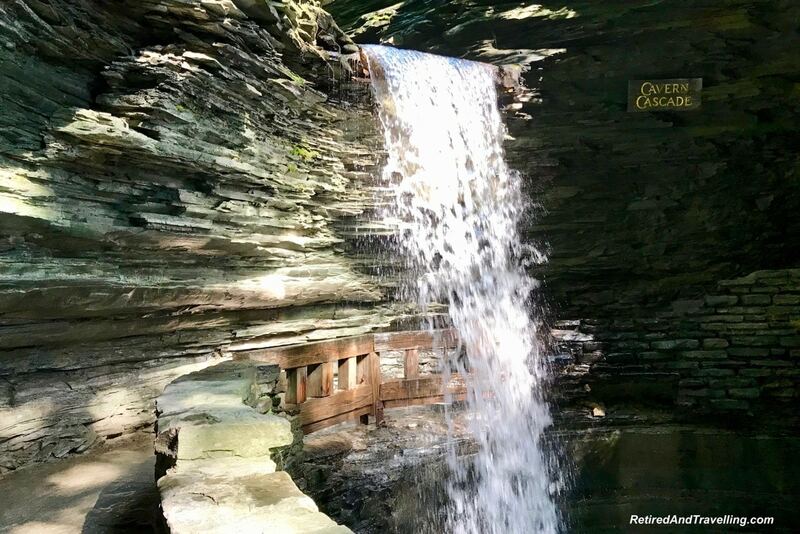 As we came to the next level we walked along until we saw the next waterfall streaming down over the path at Cavern Cascade. There was a small spot under the water flow where people stopped. Unless we moved very quickly, we definitely got wet. To move up to the next level we went up the stairs in the Spiral Tunnel. From there it was a much gentler grade along the side of much slower moving water. There were spots in the shade to cool down and watch the water flow by. In spots there were small falls with faster water. At one point we saw a suspension bridge high overhead. The stairs at Lovers Lane headed up to the higher Indian Trail. We stayed down on the Gorge Path and came to a small bridge on our path over the waterfall at Central Cascade. The walk along the flat path let us cool down. Every now and then we checked our trail map to benchmark where we were. We planned to only stop for a very short while. 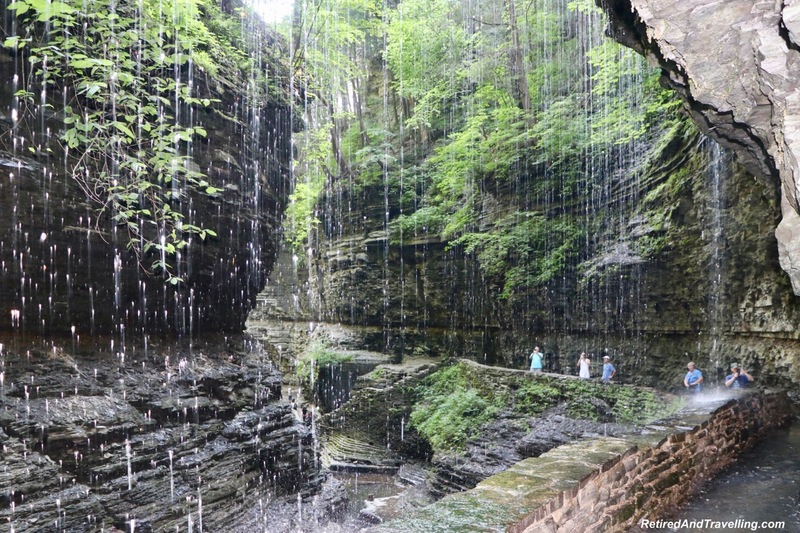 But we kept getting drawn further into the Watkins Glen Gorge waterfalls. We stopped to consider whether it was time to turn around. There were people walking back at this point. So we asked if it was worth going just a little further. 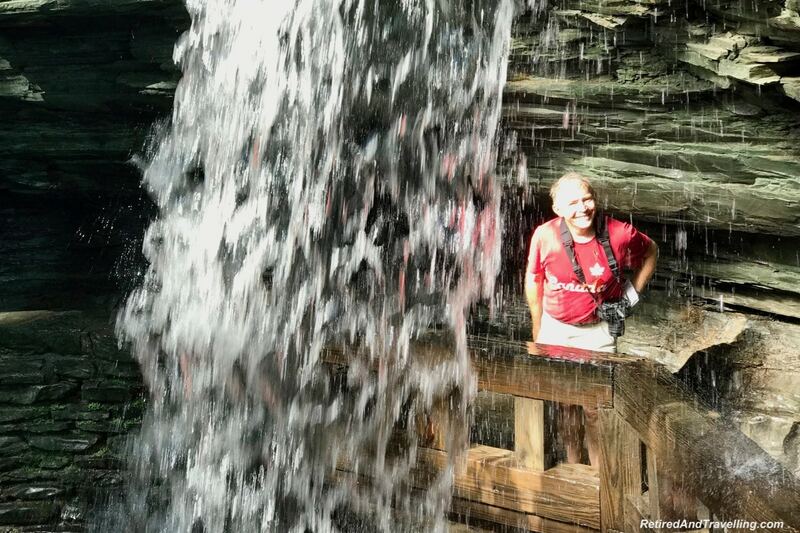 Everyone said not to miss the Rainbow Falls. At home in Toronto, we live about an hour from Niagara Falls. It is a common day trip for us to visit Niagara Falls. We knew it would not be the same. 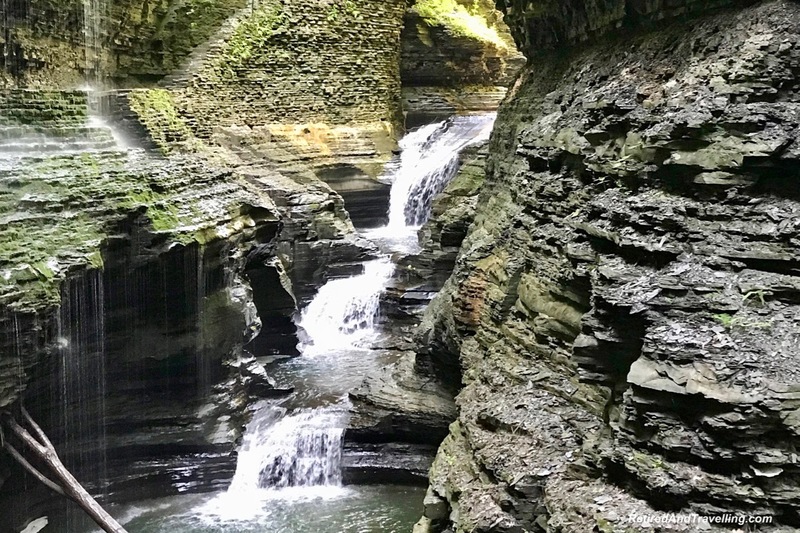 But we were glad we kept heading deeper into the Watkins Glen Gorge waterfalls. As we approached from the lower side, we got a view of the more gentle falls. And of course there was another steep set of stairs up the side of the gorge to get to the next level. When we got to the top of the stairs, we could see the Rainbow Falls. The water again cascaded over the path. We got another chance to cool down under the stream of water. We walked under the water and of course had to stop to get our picture. By this point we were pretty wet so we figured a little wetter wouldn’t matter. At the top of the bridge we got a great view down the falls. And up to the next water cascade. 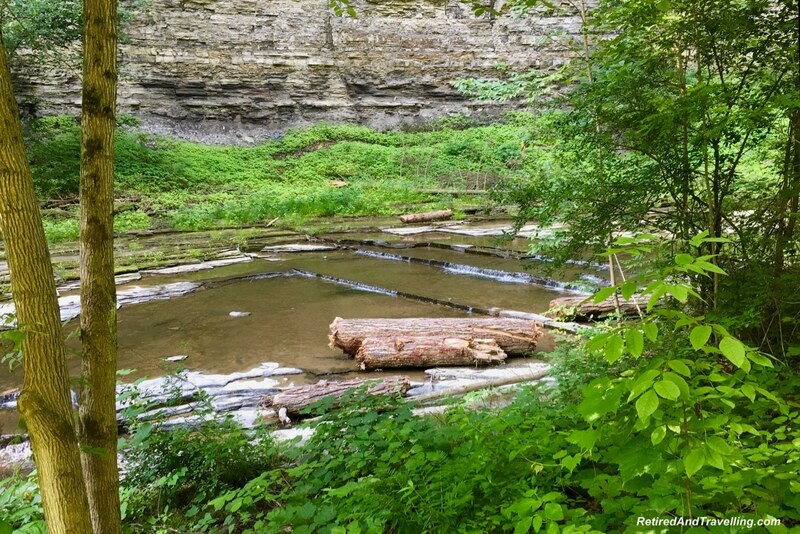 This was our point to stop on this walk along the Watkins Glen Gorge waterfalls. 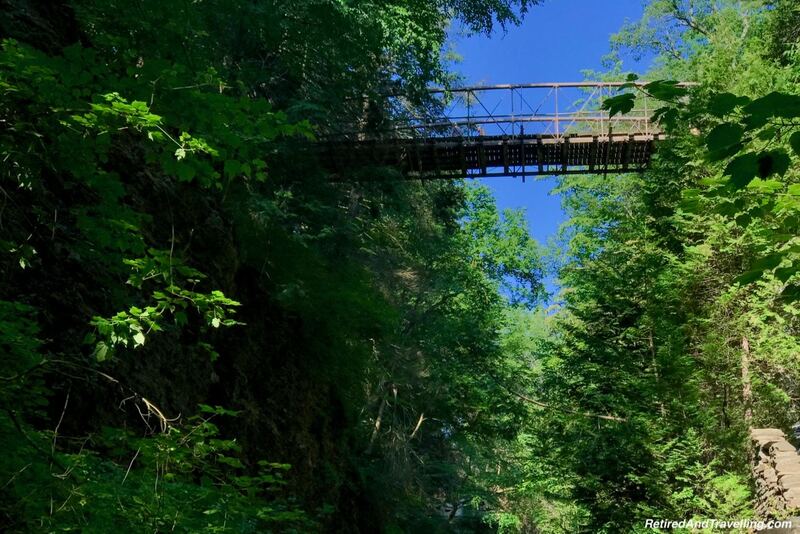 It was a great walk up the gorge. And was a bit easier and faster when we walked back. Mostly because we stopped less for pictures. It was much more of a hike than we expected when we started at the bottom of the gorge. 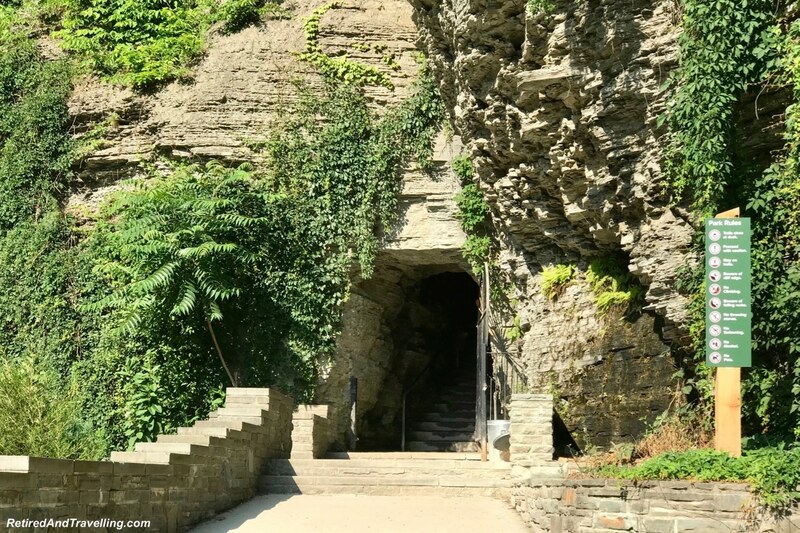 There is another entrance at the top to walk down. But unless you can get picked up at a different spot, at some point you have to climb up. It is not really a tough hike for most people. We moved at quite a quick pace because it was just a short stop for us. It was also in the middle of a summer heat wave. But if you have mobility issues this is not the walk for you. 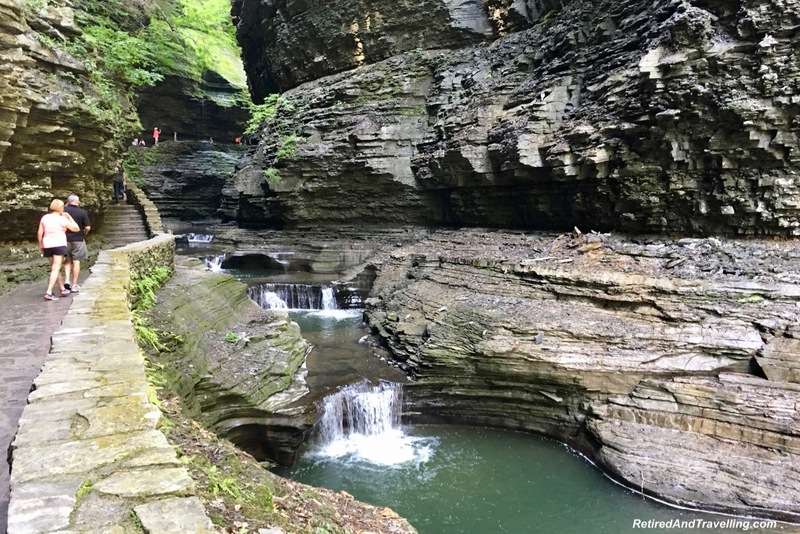 We were really glad we stopped to see the Watkins Glen Gorge waterfalls. It was a great stop on our way to visit Philadelphia! 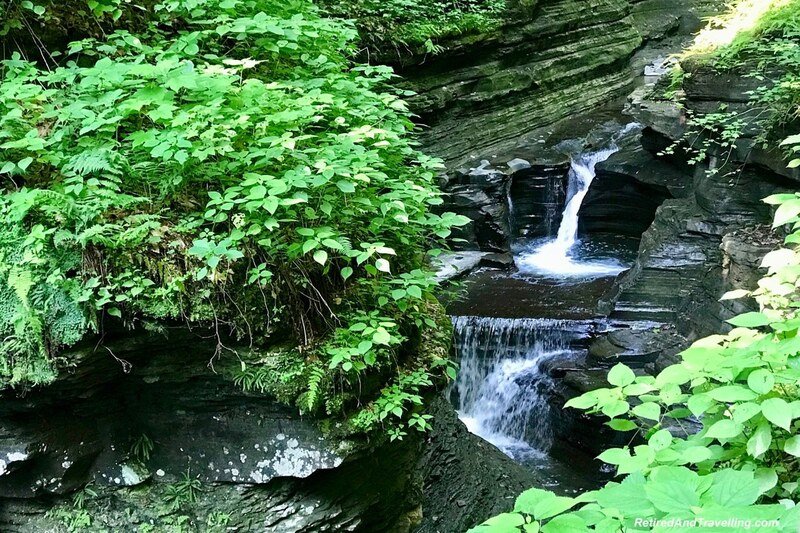 A return visit to Watkins Glen State Park in the spring when the water will be running faster is definitely something we will plan. We would love to stop when we have more time to take it a bit easier and explore the whole path. Maybe do one direction on the lower level and the other direction on the high path. 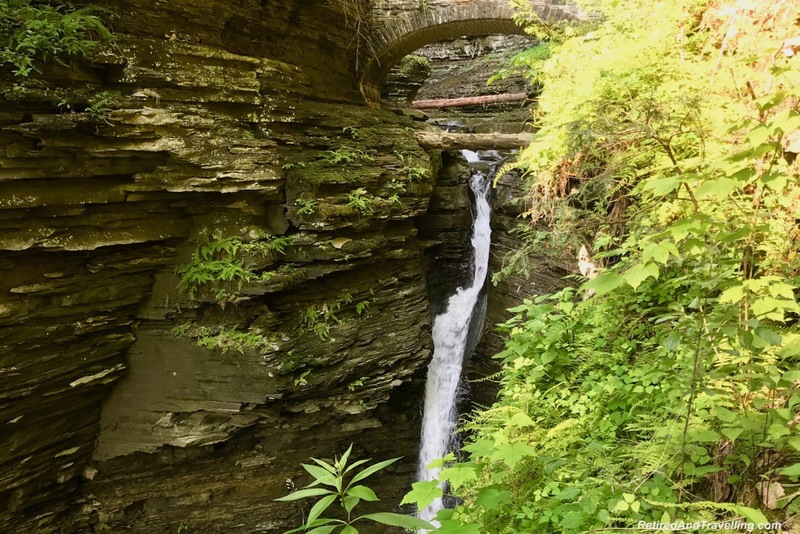 Have you visited the Watkins Glen Gorge waterfalls? Did you visit when the waters were raging? 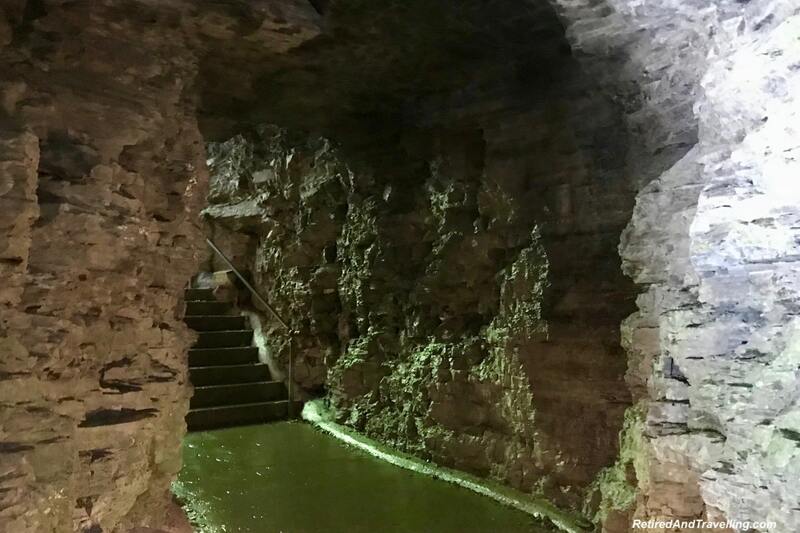 It’s pretty cool that there are stairs both outside and inside of the waterfalls/caves. Looks like a great hike. Is it only accesible with a car though? All I can say is WOW! WOW! WOW! This place looks amazing and I would love to check this out. 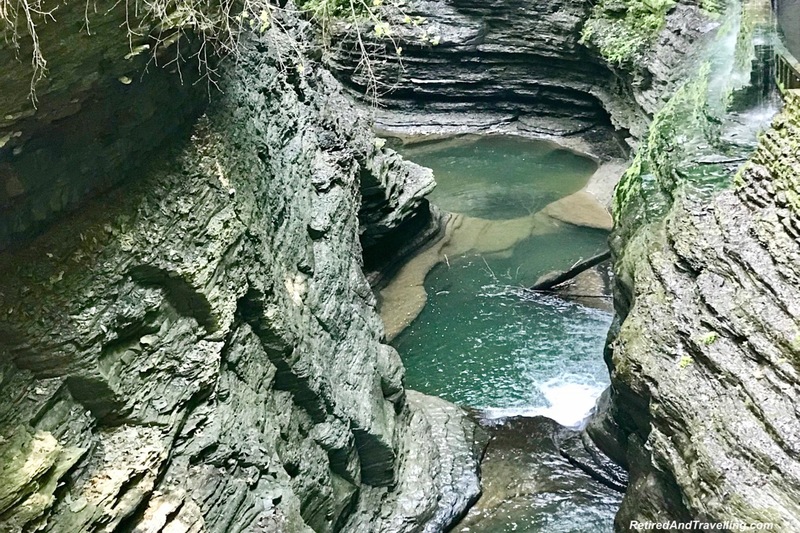 I was planning to go to Finger lakes this September but looks like I am holding that to next year so I am defo going to check this place out. What a pretty walk — it looks cool and shaded and wet, and it’s just SO hot here in Texas right now! 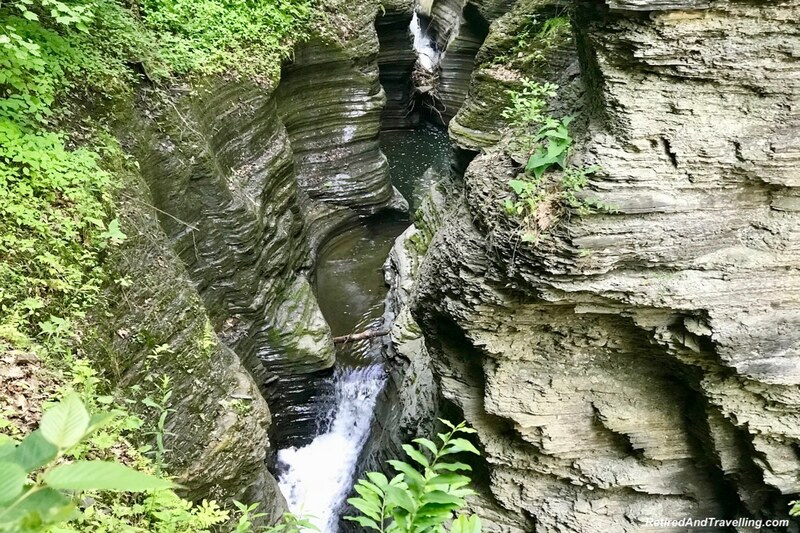 The layers of rock in the gorge are interesting, and I love the curtain of dripping water. 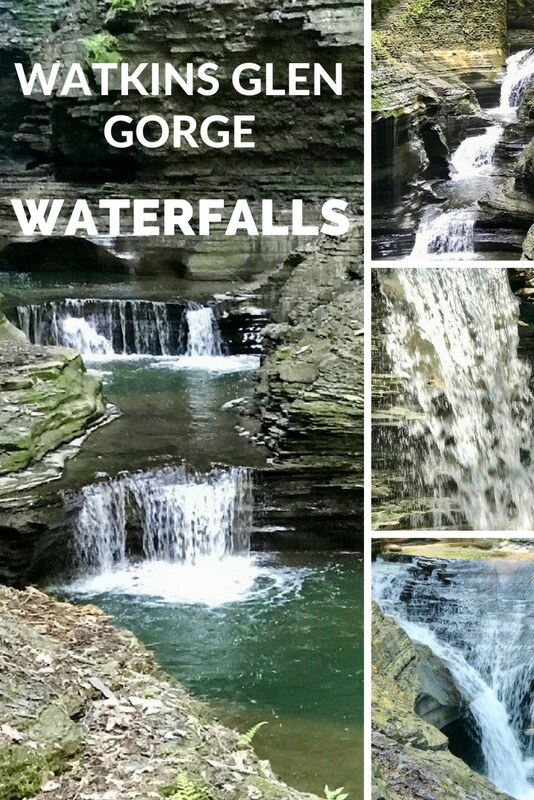 The waterfalls look lovely and I’d love to visit Glen Gorge. But thank you for the recommendation of not taking someone who has mobility issues because I love taking my parents around the world and it’s always good to know the kind of walks that they can take and those that might be tough for them. And yeah, sandals probably aren’t the best footwear for this place. 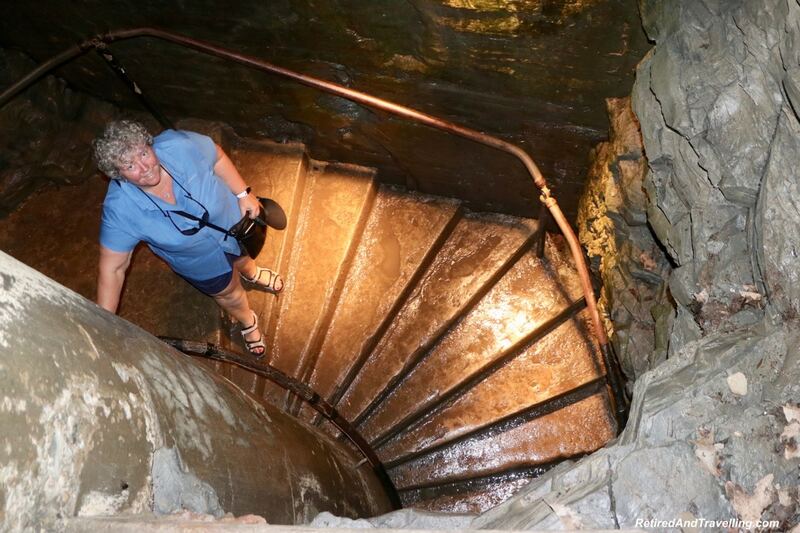 Lots of staircases, climbs and viewing points – I love it! Wow this place is incredible! I would LOVE to take a dip in a few of those cascade pools. I know you said that you were surprised that it wasn’t just a stroll. How difficult was it explore without hiking/tennis shoes? The path looks easy enough, but I can imagine the length and probably the moisture would make it more difficult. It was worth the effort to get to Rainbow Falls. A mesmerizing place and great place for photography. 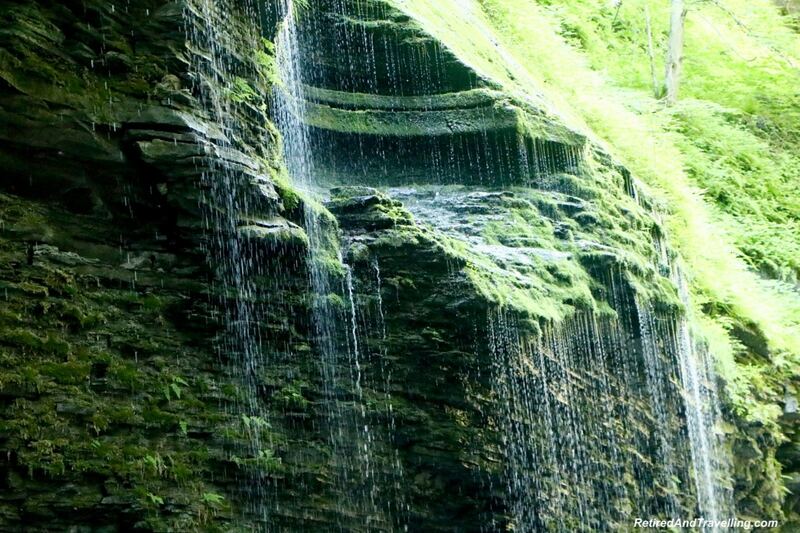 I’d love to climb the staircase of waterfalls. Such great names and what a great hike. Even if it was more than a simple stroll I’d totally be up for it. Not sure about the heat wave though! If I go to TBEX maybe I can make it a side trip.